It's back and, depressingly, the figure is even bigger than last time. Welcome again to the world of waste. 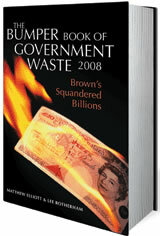 In this new edition of The Bumper Book, Matthew Elliott and Lee Rotherham have unearthed a staggering £101 billion of government misspending - all paid for by you, the taxpayer. It's such an enormous figure it is difficult to get one's head around it. What could be done with £101 billion? Well, you could for example, paper the entire East Midlands and London with £5 notes, and still have a few billion left over to build one hell of a crane from which to admire your handiwork. Or even convert the £101 billion into one penny coins, pile them on top of each other, and reach the moon and back five times. But perhaps more usefully, the government could cut the tax burden of every household by over £4,000 a year. £280,000 on a conference addressed by Blair and Brown on value for money in the public services. £400 million on 'cost control' for the Olympic Games. £3 million by tax inspectors at HM Revenue and Customs on flights, including £2.1 million on flights to Scotland. Over £16 million on the creation and upkeep of VIP lounges in Heathrow and Gatwick despite the fact they are not government-owned. £100,000 on assessing whether £400,000 reportedly spent on modern art for seven hospitals was money well spent. But then it's hardly a surprise that they don't have a tight grip on our finances when you see an official statistic from the government, claiming that an impressive 102% of all 3 year olds are in nursery school. With this level of numeracy, no wonder we're in trouble! If you're a British taxpayer, you need to read this book - even though it will hurt.